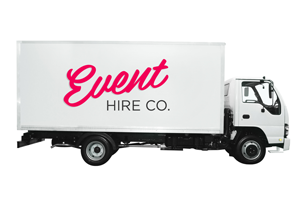 Event Hire Co has a dedicated delivery team that services all of Sydney, and most major cities across Australia. Our team operates seven days a week for your convenience. Most items are delivered on the day of the party, well before your function start time. There is also the option in most cases to have your items delivered the day earlier should this be available. Our friendly drivers will deliver all your equipment to your party location. Delivery is done on ground level and placed in a neat pile. Some items are set up as part of our package. The rest you can set up in your own time, or you can pay a small additional fee for our team to do it for you. If your items need to be delivered up levels of a building, stairs, step descents or inclines, or more than 10m away from the event space, please let our office team know. An additional fee may be applicable. Please contact our office for advice on which items include free set up and which don’t. A small delivery fee is attached to each booking to help cover the cost of transportation. Should you wish to save on these fees and if you have a suitable vehicle, you can pick up from our warehouse in Sydney. For interstate bookings, you cannot pick up from the warehouse, but we still offer a drop off and collection service. Delivery fees are calculated based on distance, the amount of items being hired and access times. We offer the most reasonable rates on delivery across the country, and practice a fairness policy.